Density is a science concept that students can apply to their lives regularly and subsequently relate it to theories of buoyancy and Archimedes’ Principle. 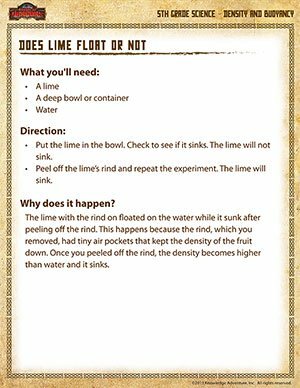 Immersing a lime into a bowl of water, with the rind and without the rind, will help 5th graders relate to the theory of density and understand it better. Encourage kids to carry out the density experiment on their own and understand the outcome. Check out other interesting science worksheets here for all grades too.